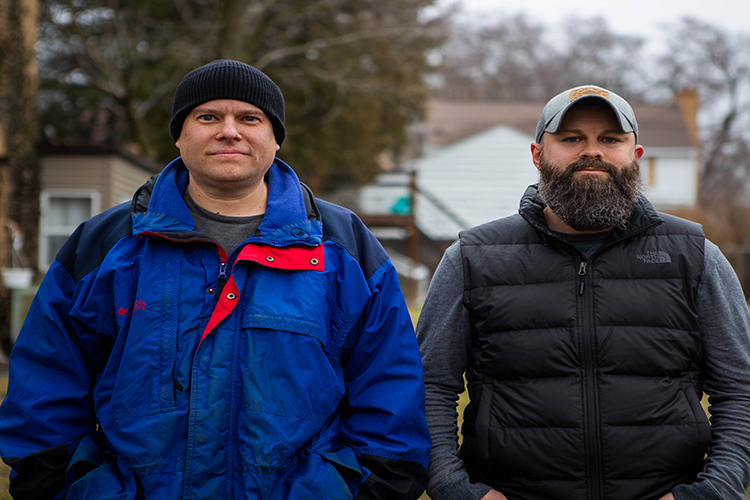 Scott Silkman and Jeremy Roberson built a tree house across their property line in Battle Creek's Northside neighborhood. A request for help to move a basketball hoop led to a friendship that goes well-beyond property lines on Orchard Avenue in Battle Creek. Scott Silkworth and his family were moving into their home on Orchard in 2011 when he asked his neighbor, Jeremy Roberson, to help him move a heavy basketball hoop. That interaction was the beginning of a neighbor-helping-neighbor ethic for the two men, but for the street which has been fostering and nurturing this ethic for as long as longtime residents can remember it was to be expected. In the 40 years that Barbara Connor, Roberson’s mother-in-law has lived on Orchard Avenue, she has seen families move in and out and witnessed an aging of the remaining residents followed by an infusion of youth and vibrancy. The one constant, she says, has been the comfort she takes in knowing that there is always someone there to lend a hand or a listening ear. When she and her husband, Jim, were raising their three daughters, neighbors pitched in money to help a fellow resident turn an empty piece of land that used to be a garden into a park-like space for everyone to enjoy. She says it’s not unusual for the neighbor next door to clear the Connors' sidewalks of snow or take care of their leaves while the neighbor collects his. “They’re always here to help. It doesn’t have to be an organized type thing,” she says. Connor, originally from Lansing, and her husband, originally from northern Minnesota, met after they both took teaching positions with the Battle Creek Public Schools. The assistant school superintendent at the time would go on recruiting missions throughout the Midwest, including Minnesota, in search of teachers. Orchard Avenue became home after a realtor showed them the Northside Historic Neighborhood. They never thought about leaving, even during a period of time when the street was undergoing a major demographic shift. Connor says the families like hers who had raised their children there were moving out, but young families weren’t coming in. That all changed about 15 years ago when Connor says she started to see young families with children moving in once more. Some of those newer residents are people who grew up on Orchard Avenue, like her daughter Shannon (Connor) Roberson. Silkworth jokingly refers to her as “neighborhood royalty” because of her long history with the area. It could be expected that the influx of new residents would not share the same neighborly ethic that has been a stable of the street, but that has not been the case. While there are a few who prefer to keep to themselves, there are a lot more who are making it a priority to reach out and be involved. They look out for one other, watch each other’s children, have impromptu backyard gatherings, and throw an eagerly-anticipated annual party that always draws a crowd. The chief organizers of this neighborhood engagement are Silkworth, Roberson, and Joe Ratti. Roberson, a nurse at Bronson Battle Creek, and his family moved into their home in 2010. Silkworth, a State Police Trooper at the Marshall post, moved next door to the Robersons' with his family one year later. In 2013, Joe Ratti, a Special Education teacher at Battle Creek Central High School and his son became residents of the street. Following a conversation with a retired state trooper and neighborhood resident who talked about a neighborhood gathering that used to take place, Silkworth, Roberson, and Ratti decided to host a neighborhood party which has become an annual signature summertime event for neighborhood residents, friends, and family. There was some concern about whether or not anyone would show up for that first gathering, but they quickly realized they had nothing to worry about as the street saw a steady flow of more than 100 people throughout the day. The Otts have lived in the same Orchard Avenue home for 36 years. When they moved in, they were among a number of families with young children. Scott Silkman and Jeremy Roberson built a tree house across their property line in Battle Creek's Northside neighborhood. Photo by Erk McCloudLast year’s party included a slip ‘n' slide that went through several yards with water that cascaded down from the top of a fire truck provided by the Battle Creek Fire Department. In addition to keeping the slide wet, it acted as a gigantic sprinkler for partygoers. A firework display that was part of the inaugural party, was shelved after cleanup proved to be a major task. But, get-togethers among the three aren’t limited to special occasions or events. A firepit in Roberson’s backyard attracts neighbors and their coolers of beer, even when there’s snow on the ground. Claire Ott, who is a retired librarian from Willard Library says she’s been invited, but has yet to make the walk over. This past Saturday the men rounded up their families to participate in the annual Festivus cardboard sled race at Leila Arboretum after receiving a phone call from Ratti on Friday night. They gathered at his house to build a cardboard sled which they used in the race. Parts of it were visible in a truck parked at the Pizza Parlor in Urbandale where they gathered after Festivus and chatted over pizza and beer. Silkworth, who was born and raised in Battle Creek, says he used to walk the streets in the neighborhood while attending Battle Creek Central High School. “I used to look at all these cool houses when I was in school and later on I was able to afford to live in one of them,” he says. As a State Police Trooper, Silkworth and his family moved around alot – six times in 10 years. He wanted to make sure that his children had a sense of history about where they grew up. Their last residence, before moving back to Battle Creek, was just north of St. Joseph and Silkworth learned rather quickly that most of his neighbors wanted to be left alone. “I was concerned about my kids not having a history and coming from a certain neighborhood. I wanted them to have a history of where they came from,” Silkworth says. When they knew they were coming back, fellow troopers told Silkworth where to look and where not to look. He ended up in that neighborhood with the “cool” houses. These commonalities include a playhouse they built for their children that straddles their property lines. The playhouse's 14 X 14 platform is attached to a tree. Two of the platform legs are in Silkworth’s yard and the other two are in Roberson’s yard. “The reason we built is that there was a brick wall between the two houses. The kids were always trying to climb over it and it was problematic and there was a garden and my wife didn’t want the kids walking through that,” Silkworth says. “It was the really big talk of the neighborhood when they were building it,” says Shannon Roberson. While being the street’s unofficial promoter, Silkworth says he understands that not everyone wants to have close relationships with their neighbors, but he learned a lesson early on in his career about making the effort. He and his training officer responded to a call from an older woman who didn’t really like her neighbor. “There had been several calls to this house,” Silkworth says. “She was mad at him for piling stuff in his driveway and I thought maybe we could go over and talk to this guy. It turned out that her neighbor had a daughter living with him who had cancer and her bed was set up in the living room. The woman just wept when she heard this.